Days Bay Play is an extension of Days Bay Playcentre that offers creative play-based education opportunities to all families in Eastbourne. 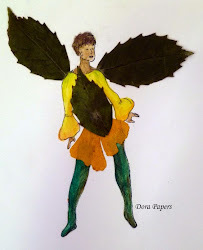 Days Bay Play has a class 'Bugs and Butterflies: The Art of Insects' for Term Two 2015. Take a look at the details below and enrol now to secure a place! About the Course: Fly into the weird and wonderful world of insects. Children will have the opportunity to sketch from life, attempt various styles and experiment with insect based patterns and designs. They will produce a number of sketches and finished artworks, and use pencils, aquarelles, pastels, and paint. All materials provided. About the Course: This course is centred on illustrating the worlds of some literary favourites for children. 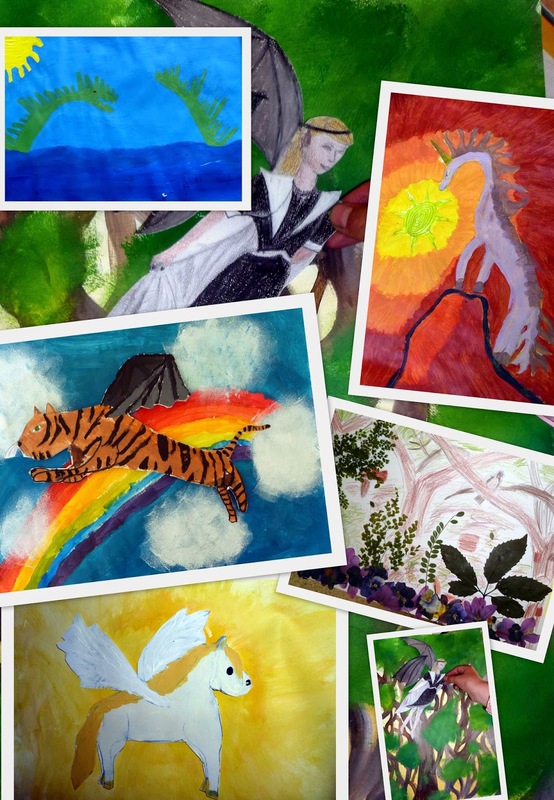 The goal of this class is to encourage children to create art from their imaginations. It is designed to allow children to experiment with different mediums, including marbling, pastels, mixed media collage and acrylic paints. They will produce a number of sketches and finished works and gain confidence with illustrating. Cost: Price $75 per Child; $140 for two in a family, All materials provided. The six afterschool sessions will include sketching, painting and mixed media. The children will learn how to press flowers and leaves, and use them to make bookmarks, cards and pictures. 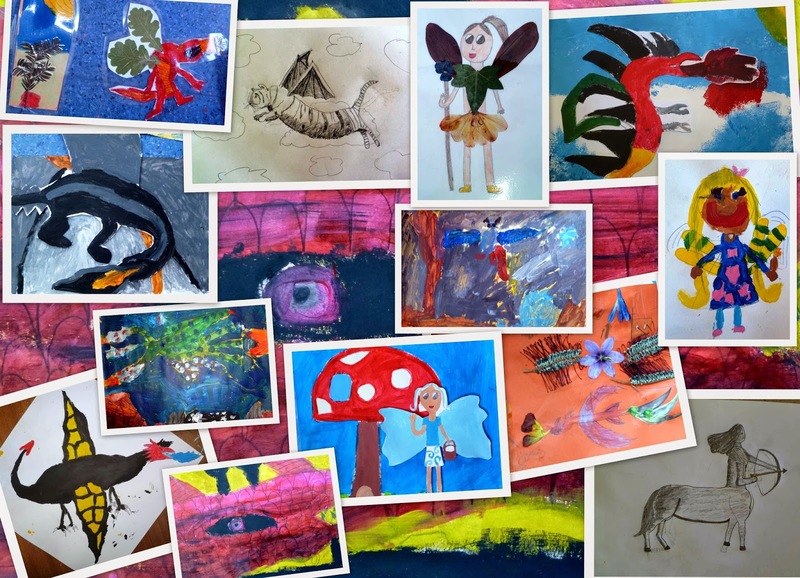 With the fantastic theme of creatures from myths and legends, they will get the opportunity to experiment with different mediums while drawing their favourite creatures, and learn a few techniques along the way. 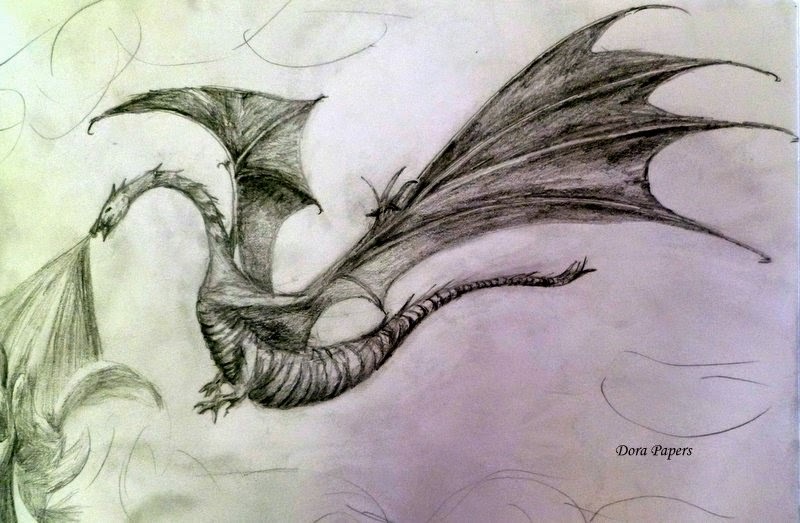 We’ll be particularly focusing on creatures that fly, so expect dragons, fairies, pegasus, gryphons and more. When: Six Monday afternoons from 3.30-5pm, starting October 20th (second week of term) and finishing December 1st (as Oct 27th is a holiday, we won’t run that Monday). Cost: $75 per child, $140 for two siblings. About the Course: This will be a six week class focusing on portraiture, with a chance for children to explore different mediums and styles, learn some techniques and have a lot of fun sketching and painting. The children will learn some of the basics of how to draw faces and look at a few different art movements/artists including Rita Angus, Paul Klee, the Impressionists, and Picasso. They will experiment with mixing colours, and use different mediums including pencil, pastel and paint. Meg Prebble will be running another six week class based around mythical creatures - a theme many young (and not so young) people delight in! This course aims to introduce a variety of mediums, including mixed media collage, pressed flowers in art, sketching and painting. You children will produce a variety of pictures, some bookmarks and cards all based on their version of mythical creatures. 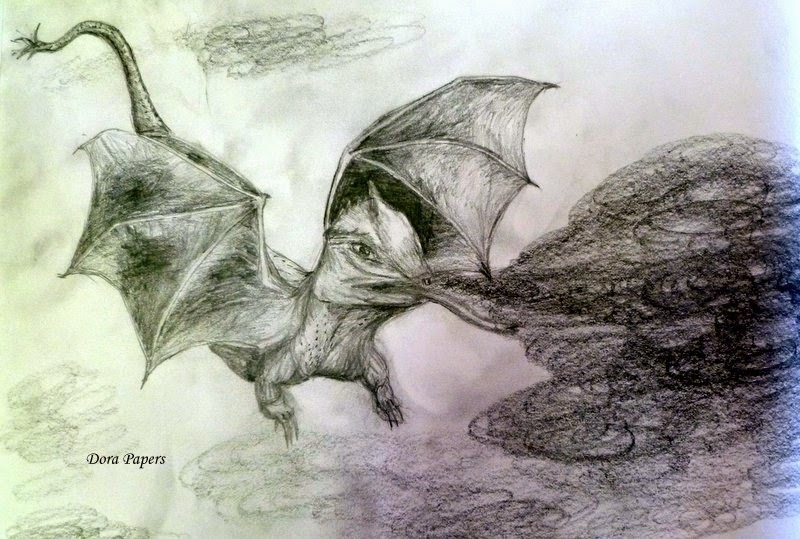 Expect dragons, fairies, gryphons and more. Please email any expressions of interest in this course to daysbayplay@gmail.com and we will keep you posted of further details. When: Six Thursday afternoons at Days Bay Playcentre starting Thursday 15th of May. With: Meg Prebble an Eastbourne based craftsperson and paper artist. About the Course: In six after school sessions children will be learning how to press flowers and make their own basic flower press, the basics of recycled paper making and an introduction to marbling. The children will make a range of paper artwork including marbled notebooks, origami and pressed flower bookmarks, using their handmade paper. This course will cater for those who are new to Meg’s paper art courses as well as providing new paper art activities, and opportunity to develop paper making and marbling skills further, for those who have done her previous paper art courses. Cost: $75 per child or $140 for two siblings. Course cost includes all materials. 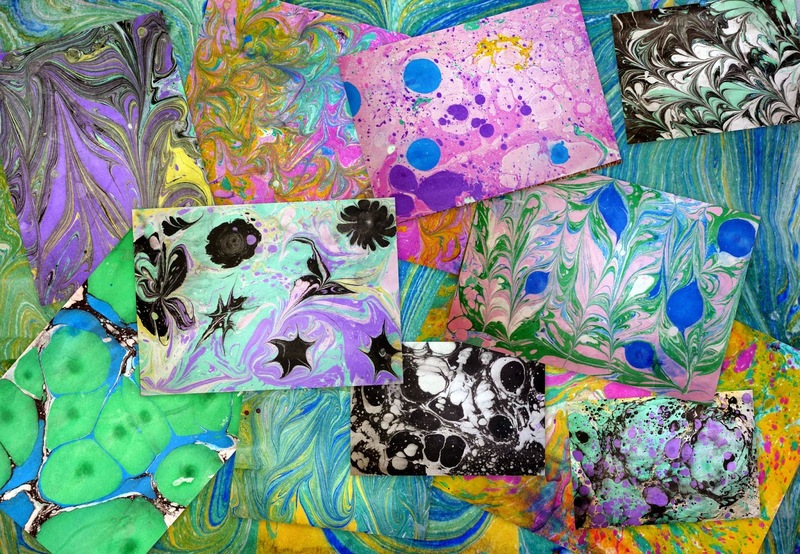 About the Course: This is a six week paper art course where children will experiment with a variety of techniques in recycled paper making, marbling, and flower pressing. The children will create a range of paper artwork including origami, marbled notebooks, and pressed flower bookmarks using their handmade paper This course will cater for those who are new to Meg’s paper art courses as well as providing some new paper art activities, and an opportunity to develop paper making and marbling skills further, for those who have done her previous paper art courses. 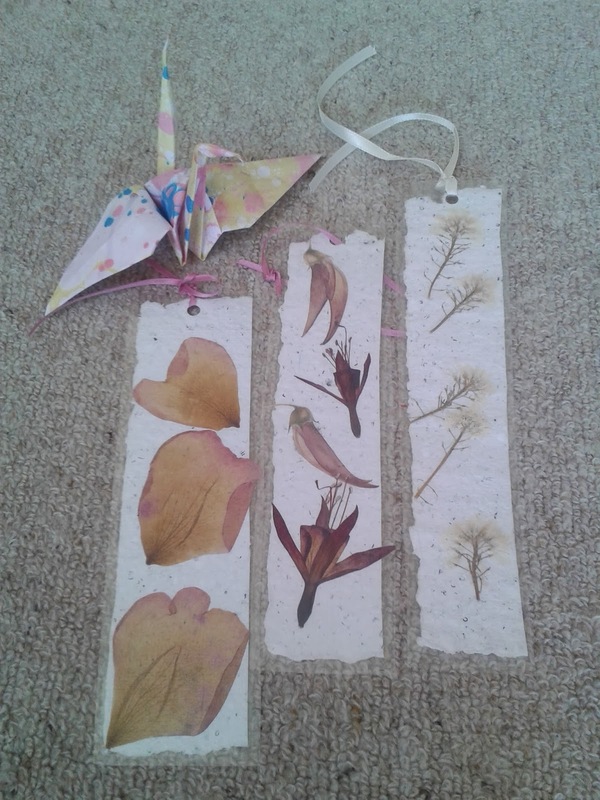 Pressed flower bookmarks on handmade paper by Charlotte and Amelia age 5 and 6; origami crane with marbled paper by Amelia age 6. When: Five Friday afternoons at Days Bay Playcentre starting Friday 14th of March. About the Course: Think of this as your after-school craft club! It doesn't matter whether your are an experienced sewer/crafter or a keen beginner - everyone is free to work at their own level and pace. We will be covering a variety of simple sewing and crafting techniques, with heaps of projects to choose from and plenty of freedom of creation. 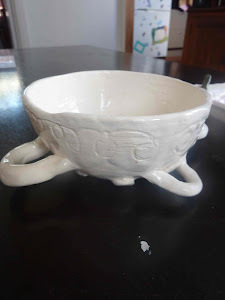 By the end of the course everyone will have completed several hand-made items to take home with them! Gabrielle is a qualified art and technology teacher who has experience with teaching primary aged children through to secondary school students. She has a variety of knowledge across all art disciplines. She is a textiles mixed-media artist with a passion for allowing young people to explore and recognise their own creative potential and to let them have FUN! Kate has a lot of experience with working with children through art and drama. She is an ex-ballet teacher and has taught drama at San Antonio School, both general drama lessons and co-ordinated 3 school productions. Kate enjoys sewing and craftwork and has experience in the theatre both designing and making costumes, props, and sets. Course Cost: $75 per child or $140 for two siblings. Course cost includes all materials. When: Wednesday 3.30 – 5pm, weeks 4 - 9 of Term 4 (Wednesday 6th of November to Wednesday 11th of December). 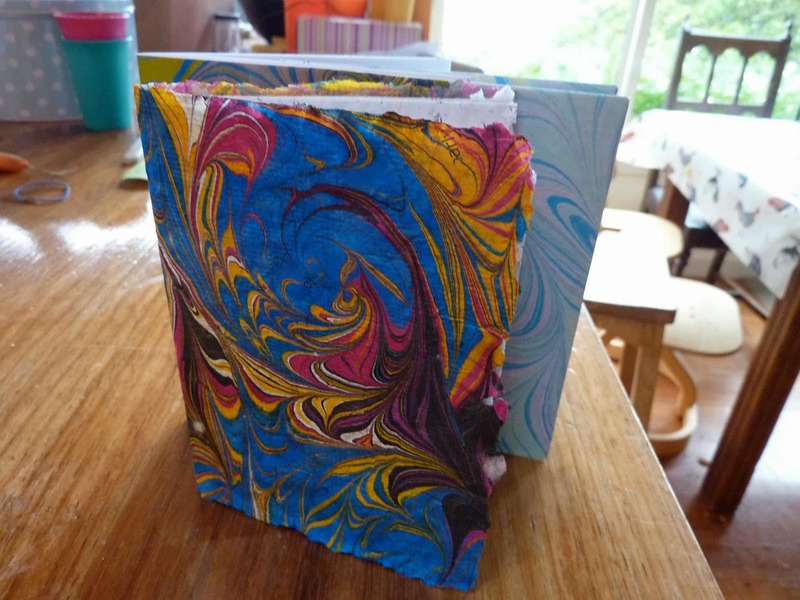 What: As well as covering the basics of marbling for newcomers this six week course will also teach an intermediate level of marbling, including how to make specific marbling designs such as the gelgit, extending those children who took Meg's paper art course in term 2. Children will also do some paper-mâché, making and marbling colourful containers. Children will also use their marbled paper products to make handcrafted notebooks and origami figures. It’s all about having fun with paper and paint. This course is suitable for ages 8-12, or anyone who took my last paper course in term two. Cost: $75 per child for the six week course. Course cost includes all materials. Class size: maximum 10 children.